Robert Layton, who has provided the booklet notes for this album, describes the treasure-trove of Sibelius's songs as one of music's best-kept secrets. The composer wrote a surprisingly large number of songs throughout his life, and anybody who responds to the Nordic spirit and subject-matter of the symphonies and other orchestral music will find much to please them here. They are tuneful, passionate and evocative of the northern latitudes. Virtually all of them are in Swedish which, although he was Finnish, was Sibelius's first language, but the Opus 50 set is in German. There are no fewer than seven settings of the composer's favourite poet of the northern landscapes, Johan Runeberg, including two of Sibelius's best-known songs, 'The tryst' and 'The first kiss'. Our singer is the delightful Swedish soprano Katarina Karnéus, sometime winner of the Cardiff Singer of the World Competition. Apart from his lifelong fascination for the symphonic challenge, there are three sources of inspiration running through Sibelius’s art: first, the Nordic landscape which one can glimpse in almost all genres he touched; secondly, the rich heritage of Finnish mythology enshrined in the Kalevala which fertilized his imagination, from The swan of Tuonela at the beginning of his career to Tapiola at the very end; and thirdly, the music of the Swedish-language nature poetry to which he was drawn for so much of his life. The songs are among the best-kept secrets of the repertoire and an enormous treasure. Almost a quarter of Sibelius’s songs are settings of Johan Ludvig Runeberg (1804–1877), the great Finnish poet writing in Swedish, and without doubt Sibelius’s favourite poet. The Opus 13 settings are all Runeberg and they come from the early 1890s: indeed, they were announced in the press as early as 1892, the same year in which he had scored his breakthrough with the Kullervo Symphony. They include Våren flyktar hastigt (‘Spring is flying’) and Under strandens granar (‘Under the fir trees’), the latter written on his honeymoon at Monola in Lake Pielsjärvi in the summer of 1892. Runeberg’s poem has something of the spirit of a folk-ballad: it tells how a watersprite seduces a handsome youth by assuming various disguises. Sibelius’s setting makes use of some freely-conceived recitative and the piano texture is obviously conceived in orchestral terms. Its companion on this recording, Våren flyktar hastigt is one of his most perfect miniatures whose flexible, pliable phrases suggest the transience of the seasons. The Opus 17 set was written at various times between 1892 and 1902, and includes Illalle (‘To evening’, 1898), one of his rare settings of Finnish and among the most lyrical and affecting of his songs†. It is sometimes sung in Swedish too, as Om kvällen. There is great purity of line, a complete simplicity and a total harmony of means and ends. The accompaniment is confined to the simplest filling in of harmonies, and the setting of the language is guided by its own verbal music. It needs no special knowledge of the language to see that Sibelius alters his approach to the voice when setting Finnish. The vocal line seems to carry so much of the music of the language itself: to hear Illalle given in Swedish is quite a different experience. Finnish is a highly inflected language, rich in vowel sounds, and these songs reflect Sibelius’s growing confidence in handling it. Right up to the early 1890s Sibelius still made small mistakes in writing Finnish. 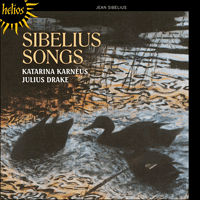 The Opus 36 songs are among Sibelius’s most popular. Svarta rosor (‘Black roses’) is probably the best known of all of them and its fascination lies in the way the mood darkens at the words ‘Ty sorgen har nattsvarta rosor’ (‘for grief has roses black as night’). This phrase is poised on the second position of the chord of C sharp minor before resolving on the C major tonic. But although it is a fine song and deserves its popularity, it pales in comparison with the second of the group, Men min fågel märks dock icke (‘But my bird is long in homing’), another Runeberg setting. This has a simplicity of utterance, an immediacy of atmosphere and a sheer melodic sweep that earn it a high position in the Sibelian pantheon. Runeberg’s nature lyricism seems to call on the deepest vein of inspiration in Sibelius, for not only is Men min fågel märks dock icke one of his most perfect songs, but it also ranks as one of the finest in the whole romans repertoire. In his definitive five-volume study of the composer, Erik Tawaststjerna reminds us that the rising figure which opens it ‘almost recalls the opening of The swan of Tuonela and that, of course, the song itself begins by a reference to a swan!’. Karl Ekman gives 1899 for these songs but this holds only for the first three. Fazer and Westerlund, the Helsinki publisher, bought Svarta rosor for the then substantial sum of 370 Finnish marks, and it is obvious that Men min fågel and Bollspelet vid Trianon were included in the deal. Bollspelet vid Trianon (‘Tennis at Trianon’) is a setting of Gustaf Fröding, one of the greatest Swedish romantic poets of the nineteenth century, and the poem strikes a particularly responsive chord in Sibelius for the piano part has a finesse not always encountered in his keyboard writing. Bollspelet vid Trianon shows considerable subtlety in the handling of contrast and the alternation between recitative and a pastiche pastoral style, and there is in the background a sense of foreboding at the approaching revolution. Säv, säv, susa (‘Reeds, reeds, whisper’, though more often known as ‘Sigh, sedges, sigh’) is also to a poem of Fröding, a poem that is in itself so rich in verbal music that it must have represented an enormous challenge to the composer. Sometimes known in English as Ingalill, after the heroine of the poem, it in every way deserves its popularity. Sibelius heightens the music of the words by a gentle, sighing accompaniment of a harp-like character—indeed the harp plays an important part in the orchestral transcription by Alexander Hellman (which Sibelius subsequently authorized) and the return to the opening section is both magical and touching. For the remaining two songs of Opus 36, Marssnön (‘The March snow’) and Demanten på Marssnön (‘The diamond on the March snow’), Sibelius turned to Josef Julius Wecksell (1838–1907), a Finnish poet writing in Swedish whose work owes something to Heine. He is said to have something of the intensity of Shelley though he succumbed to insanity at a relatively early age. Both poems dwell on the theme of death casting its shadow over the moment of fulfilment. The Opus 37 set includes two Runeberg settings: Den första kyssen (‘The first kiss’) and Flickan kom ifrån sin älsklings möte (‘The girl returned from meeting her lover’), sometimes known as ‘The tryst’. As usual when he is setting Runeberg, the musical language is direct and concentrates on line with a generally functional piano accompaniment providing harmonic support. Den första kyssen was written for Ida Ekman, the mother of his first biographer, Karl Ekman, and an eloquent interpreter of his songs. (It was she who, accompanied by Hanslick, sang one of his songs to Brahms in 1895.) Den första kyssen, incidentally, comes from 1900, not 1898 as listed in Ekman, Solanterä and the earlier editions of my own Master Musicians monograph. Lasse liten (‘Little Lasse’) is from 1902, as is Soluppgång (‘Sunrise’)—again, recent evidence has disproved the previously accepted dating. In May 1902, Sibelius spoke of his working on Tor Hedberg’s Soluppgång, which he described as ‘a slight but powerfully atmospheric poem’. And so indeed it is, and Sibelius’s setting evokes its mood with great finesse. Lasse liten has been criticized for its low-lying accompaniment, almost exclusively in the bass clef. Yet, oddly enough, its subtle rhythm, so completely attuned to the speech rhythm of Topelius’s verse, strikes a note of conviction, and the dark colours evoked convey an idea of the big wide world with all its attendant dangers that lurks outside the mother’s sheltering embrace. German was, of course, Sibelius’s first foreign language (he spoke little French or English) and it was natural that at a time when his music was beginning to find a welcome in Germany in the first years of the century he should turn in his Opus 50 to a major language. Two of the set, Im Feld ein Mädchen singt (‘In the field a maiden sings’) and Die stille Stadt (‘The silent town’) are among his greatest songs. Lenzgesang (‘Spring song’), to words of Fitger, suffers from a piano accompaniment set in too low in register, which does not really blend with the voice, but the vocal part itself has exuberance and charm, as indeed does its immediate successor Sehnsucht (‘Longing’, or ‘Loneliness’). This has the simplicity and polish of the best Swedish settings, and the piano accompaniment has an affecting directness and economy. The piano part, syncopated chords gently adumbrated, lend the song a special pathos. The first of the Dehmel settings, a poet also favoured by Mahler, Aus banger Brust (‘From anxious heart’) is an impassioned one, and Sibelius subsequently scored it, but the real masterpiece here is its companion, Die stille Stadt. This has the concentration and atmosphere of a tone-poem: indeed, its serenity, beauty of line and sense of repose mark it out from the others. It is a grievously neglected song and has great distinction and refinement of feeling. Its subtle shifts of harmonic emphasis resonate in the memory. The last of the set, Rosenlied (‘Rose song’), though not in the same league, has great charm and an almost Viennese lilt. The Opus 50 songs come from 1906, the year in which he also composed the symphonic fantasy, Pohjola’s daughter and the incidental music to Hjalmar Procopé’s play, Belshazzar’s feast. It is from the latter that Den judiska flickans sång (‘The Jewish girl’s song’) comes. It is a touching and contemplative piece, more familiar as ‘Solitude’ in the concert suite Sibelius made later that same year. Ernst Josephson (1851–1906) was not only a poet but a painter as well. He spent most of his life in France and studied with Manet, and his paintings have to some extent overshadowed his achievement as a poet. The eight Josephson settings of Opus 57 come from 1909, the same year as the Voces intimae String Quartet. By far the loveliest of the set is the fifth song, Jag är ett träd (‘I am a tree’), which has a much bolder sense of line than its companions and a much more powerful and deeply characteristic atmosphere. Näcken (‘The Watersprite’ or ‘Elf-king’) is an interesting song, too, touched with striking moments of dark poetry. During the 1914–18 war Sibelius was cut off from his income, and composed an abundance of miniatures including four sets of songs, Opp. 72, 86, 88 and 90, the latter to Runeberg texts. The first of the Opus 90 set is the most celebrated of the group: Norden (‘The North’), as in all the nature poetry of Runeberg, touches a special vein of inspiration in the composer. A steady, gentle syncopated figure is sustained throughout and serves to focus attention on the changing harmonies and the eloquent vocal line. En dehors d’une fascination constante pour le défi que représentent les symphonies, l’art de Sibelius connaît trois sources d’inspiration: la première est le paysage nordique qui apparaît dans tous les genres auxquels il a touché; la seconde est le riche héritage de la mythologie finlandaise concentrée dans le Kalevala dont il a tiré une création fertile, du Cygne de Tuonela au début de sa carrière à Tapiola qui marque la fin de ses compositions; et la troisième est la musique de la poésie naturelle en suédois vers laquelle il fut tant attiré. Ses mélodies figurent parmi les secrets les mieux gardés du répertoire et représentent un immense trésor. La grande majorité de ces mélodies sont en suédois, langue maternelle de Sibelius. Il n’a en effet commencé à apprendre le finnois qu’à l’âge de huit ans pour préparer son entrée dans la première école primaire finlandaise du pays, la Hämeenlinna Soumalainen Normaalilyseo. Avec le Traité de Tilsit, la Finlande fut rattachée à l’empire tsariste, mais les Russes continuèrent à administrer le pays, devenu le «Grand-duché de Finlande», selon le service civil existant qui avait été mis en place pendant les six cents ans de la période suédoise. Par conséquent, le suédois resta la langue du gouvernement, parallèlement au russe, et le privilège des classes instruites, le finnois étant la langue du peuple. Dans l’école où étudia Sibelius, l’enseignement pouvait être fait en langue vernaculaire, et non uniquement en suédois et en latin. Ce fut donc la première occasion pour lui de découvrir la poésie populaire finlandaise qui devait tant inspirer par la suite sa musique orchestrale. Mais sur la centaine de mélodies à laquelle viennent s’ajouter les quelques trois douzaines d’ébauches supplémentaires, peu furent consacrées à des textes de poètes suédois. Soit dit en passant, plusieurs des ébauches portent sur le même poème. Une des premières œuvres poétiques que Sibelius mit en musique fut un texte de Runeberg, Serenad («Sérénade», 1888). De la même période sont issus des morceaux comme Näcken («Ondine», 1888), avec accompagnement au violon, violoncelle et piano, sans rapport aucun avec l’arrangement de l’op.57 nº 8 sur cet enregistrement; Skogsrået («La nymphe des bois», 1888/9) d’après un texte de Viktor Rydberg et un autre morceau d’après Rydberg, Höstkväll («Soir d’automne»), totalement différent de l’arrangement de 1903, op.38 nº 1. (Cf. Robert Keane: «Höstkväll—two versions?», Finnish Musical Quarterly, 1990). Presque un quart des mélodies de Sibelius sont des mises en musique de textes de Johan Ludvig Runeberg (1804–1877), le célèbre poète finlandais qui écrivait en suédois et, sans aucun doute, le poète favori du compositeur. L’ensemble de l’opus 13 se base sur des poèmes de Runeberg et a été créé au début des années 1890: ces mélodies ont en effet été citées dans la presse dès 1892, c’est-à-dire la même année que celle de la symphonie Kullervo qui connut un immense succès. Elles comprennent Våren flyktar hastigt («Le printemps s’envole») et Under strandens granar («Sous les sapins»), la dernière ayant été composée pendant la lune de miel de Sibelius à Monola près du lac Pielsjärvi au cours de l’été 1892. Le poème de Runeberg a quelque chose qui relève de l’esprit d’une ballade populaire: il raconte comment une ondine séduit un beau jeune homme en revêtant divers déguisements. L’arrangement de Sibelius utilise quelques récitatifs librement conçus et le piano est manifestement pensé en termes orchestraux. Son compagnon sur cet enregistrement, Våren flyktar hastigt est une des plus parfaites miniatures dont les phrases souples et malléables suggèrent la nature passagère des saisons. L’opus 17 a été écrit à divers moments entre 1892 et 1902; il comprend Illalle («Au soir», 1898), une des rares compositions en finnois de Sibelius et l’une de ses mélodies les plus lyriques et les plus touchantes. Elle est aussi chantée de temps à autre en suédois sous le titre Om kvällen. Cette mélodie est marquée par une grande pureté de ligne, une parfaite simplicité et une totale harmonie des moyens et des fins. L’accompagnement s’en tient aux harmonies les plus simples et l’arrangement du langage est guidé par sa propre musique verbale. Il n’est pas nécessaire d’avoir une connaissance particulière de la langue pour s’apercevoir que Sibelius a eu une approche différente concernant la voix lorsqu’il a réalisé l’arrangement en finnois. La ligne vocale semble porter une bonne part de la musique de la langue elle-même: écouter Illalle en suédois est une expérience tout à fait différente. Le finnois est une langue très fléchie, riche en voyelles, et ces mélodies reflètent la confiance croissante de Sibelius à la manipuler. Jusqu’au début des années 1890, il faisait encore quelques fautes en écrivant le finnois. Les mélodies de l’opus 36 sont parmi les plus célèbres qu’il ait composées. Svarta rosor («Roses noires») est sans doute la plus connue d’entre toutes et la fascination qu’elle provoque repose sur la façon dont l’atmosphère s’assombrit lors du passage «Ty sorgen har nattsvarta rosor» («car le chagrin porte des roses noires comme la nuit»). Cette expression est placée sur la seconde position de l’accord d’ut dièse mineur avant de se résoudre sur la tonique d’ut majeur. Mais bien qu’il s’agisse d’un excellent morceau et qu’il mérite sa popularité, il fait pâle figure en comparaison avec la deuxième mélodie du groupe, Men min fågel märks dock icke («Mais mon oiseau tarde à rentrer»), autre mise en musique de Runeberg. Cette dernière possède une simplicité de paroles, une atmosphère immédiate et une portée mélodique pure qui lui valent une place de choix dans le panthéon Sibélien. Le lyrisme naturel de Runeberg semble apporter une réponse à la plus profonde veine d’inspiration de Sibelius car Men min fågel märks dock icke n’est pas seulement un de ses morceaux les plus parfaits, il est aussi une des mélodies les plus inégalables du répertoire des romans. Dans son étude de référence en cinq volumes sur le compositeur, Erik Tawaststjerna signale que la figure montante qui en fait l’ouverture «rappelle presque l’ouverture du Cygne de Tuonela et que, bien entendu, le poème lui-même commence par une référence à un cygne!». Karl Ekman date ces mélodies de 1899 mais cela ne vaut que pour les trois premières. Fazer et Westerlund, l’éditeur d’Helsinki, acheta Svarta rosor pour la somme considérable de 370 marks finlandais d’alors et il est évident que Men min fågel et Bollspelet vid Trianon étaient compris dans le lot. Bollspelet vid Trianon («Tennis au Trianon») est inspiré d’un poème de Fröding, un des plus grands poètes romantiques suédois du dix-neuvième siècle, et ce poème a su toucher Sibelius de façon particulière puisque la partie au piano a une finesse que l’on ne retrouve pas toujours dans son œuvre. Bollspelet vid Trianon fait montre d’un raffinement considérable dans la manipulation du contraste et l’alternance entre un style récitatif et un style pastoral pastiche. Il y a en outre, en arrière-fond, un mauvais pressentiment à l’approche de la révolution. Säv, säv, susa («Roseaux, roseaux, soupir») se base également sur un poème de Fröding, poème qui est en lui-même tellement riche de musique verbale qu’il a dû représenter un défi phénoménal pour le compositeur. Parfois désigné en anglais sous le titre de «Ingalill», du nom de l’héroïne du poème, il mérite à tous égards sa popularité. Sibelius rehausse la musique des mots par un accompagnement léger et plaintif s’apparentant au caractère de la harpe—celle-ci joue d’ailleurs un rôle important dans la transcription orchestrale par Alexander Hellman que Sibelius autorisa par la suite—et le retour à la section d’ouverture est tout à la fois magique et touchant. Pour les deux dernières mélodies de l’opus 36, Marssnön («La neige de mars») et Demanten på Marssnön («Le diamant sur la neige de mars»), Sibelius s’est tourné vers Josef Julius Wecksell (1838–1907), poète finlandais qui écrivait en suédois et dont les travaux ont une touche de Heine. Certains ont dit qu’il y avait en lui un peu de l’intensité de Shelley bien qu’il soit tombé dans la folie relativement jeune. Les deux poèmes ont pour thème la mort jetant son ombre au moment de l’accomplissement. L’opus 37 comprend deux mises en musique de poèmes de Runeberg: Den första kyssen («Le premier baiser») et Flickan kom ifrån sin älsklings möte «La jeune fille revint d’un rendez-vous avec son fiancé», parfois connue sous le titre «Le rendez-vous amoureux». Comme toujours lorsque Sibelius se base sur des poèmes de Runeberg, le langage musical est direct et se concentre sur un accompagnement fonctionnel au piano qui assure le support de fond harmonique. Den första kyssen a été écrit pour Ida Ekman, mère du premier biographe du compositeur, Karl Ekman, et interprète éloquente de ses mélodies. (C’est elle qui, accompagnée par Hanslick, a interprété une de ses mélodies devant Brahms en 1895). Den första kyssen, soit dit en passant, date de 1900 et non de 1898 comme l’affirment Ekman, Solanterä et les précédentes éditions de ma propre monographie Master Musicians. Lasse liten («Lasse le petit») date de 1902, de même que Soluppgång («Lever du soleil»)—une fois encore, des recherches récentes ont permis de revoir la datation qui était acceptée jusqu’alors. En mai 1902, Sibelius évoqua Soluppgång de Tor Hedberg dans les termes suivants: «un poème léger mais riche en atmosphère». Et c’est effectivement le cas, cette mélodie transcrit avec une grande finesse l’état d’esprit de Sibelius. Lasse liten a essuyé des critiques pour son accompagnement grave, presque exclusivement en clé de fa. Cependant, aussi étrange que cela puisse paraître, son rythme subtil, tellement en harmonie avec le rythme des vers de Topelius, apporte une note de conviction, et les couleurs sombres évoquées donnent une idée de l’immensité du monde avec tous les dangers qui peuvent exister hors des bras maternels protecteurs. L’allemand était, bien entendu, la première langue étrangère de Sibelius (il n’avait que quelques notions de français ou d’anglais) et il était naturel qu’au moment où l’Allemagne commençait à réserver un bon accueil à sa musique au début du siècle, il oriente son opus 50 vers cette langue majeure. Deux des mélodies de l’ensemble, Im Feld ein Mädchen singt («Dans le champs chante une jeune fille») et Die stille Stadt («La ville silencieuse») font partie de ses plus grandes mélodies. Lenzgesang («Chant de printemps»), sur un poème de Fitger, souffre d’un accompagnement au piano d’un registre trop bas, qui ne se mélange pas réellement avec la voix, mais la partie vocale en elle-même possède charme et exubérance, de même bien entendu que le morceau qui suit Sehnsucht («Envie» ou «Solitude»). Celui-ci a la simplicité et le poli des plus beaux arrangements suédois et l’accompagnement au piano est touchant par son côté à la fois direct et économe. La partie au piano, des accords syncopés légèrement esquissés, donnent à ce morceau un pathos particulier. Le premier des arrangements d’après Dehmel, poète également apprécié de Mahler, Aus banger Brust («D’un cœur anxieux») est passionné et Sibelius l’a par la suite mis en musique, mais le véritable chef-d’œuvre ici est la mélodie suivante, Die stille Stadt. Celle-ci possède la concentration et l’atmosphère d’un poème tonal: en effet, sa sérénité, sa beauté et le sentiment de bien-être qui en ressort la démarquent des autres. C’est un morceau trop souvent négligé qui possède une grande distinction et un grand raffinement en matière de sentiments et dont les légers changements harmoniques résonnent dans la mémoire. La dernière mélodie de l’ensemble, Rosenlied («Le chant de la rose»), bien qu’elle ne s’inscrive pas dans la même lignée, possède un immense charme et un rythme quasi viennois. Les mélodies de l’opus 50 furent composées à partir de 1906, année au cours de laquelle Sibelius créa également la fantaisie symphonique La fille de Pohjola et la musique de la pièce de Hjalmar Procopé, Belshazzar’s feast. C’est de cette dernière qu’est tiré Den judiska flickans sång («La chanson de la jeune fille juive»). Morceau touchant et contemplatif, il est mieux connu sous le nom «Solitude» dans la suite de concert que Sibelius créa plus tard la même année. Ernst Josephson (1851–1906) ne fut pas uniquement un poète mais également un peintre. Il passa la majeure partie de sa vie en France et étudia avec Manet, ses peintures ayant dans une certaine mesure éclipsé ses talents de poète. Les huit mélodies de l'opus 57 inspirées de Josephson furent composées à partir de 1909, la même année que la création du quatuor à cordes Voces intimae. La plus belle des huit est de loin la cinquième, Jag är ett träd («Je suis un arbre»), qui s’illustre par un sens du vers bien plus vigoureux et une atmosphère tout à fait caractéristique. Näcken («Ondine») est également intéressant pour ses moments dramatiques de poésie sombre. Pendant la guerre de 1914–18, Sibelius fut privé de la rente qu’il recevait et composa un grand nombre de miniatures dont quatre ensembles de mélodies, les opp.72, 86, 88 et 90, le dernier d’après des textes de Runeberg. Le premier morceau de l’opus 90 est le plus célèbre du groupe: Norden («Le nord») qui, comme toute la poésie de Runeberg sur la nature, trouve un écho particulier dans l’inspiration du compositeur. Un style régulier et légèrement syncopé est maintenu en permanence et permet de centrer l’attention sur les harmonies changeantes et l’éloquence de la ligne vocale. Außer der lebenslangen Faszination, die die sinfonische Herausforderung auf Sibelius ausübte, gibt es drei Inspirationsquellen, die in seine Kompositionskunst einfließen: zuallererst die nordische Landschaft, die man in fast allen von ihm berührten Genres flüchtig erblicken kann; zweitens das reiche Erbe der finnischen Mythologie, das in der seine Fantasie beflügelnden Kalevala bewahrt wurde—vom Schwan von Tuonela zu Beginn seiner Laufbahn bis hin zu Tapiola ganz an ihrem Ende; und drittens die Musik der Naturpoesie in schwedischer Sprache, zu der er sich während einer so langen Zeit seines Lebens hingezogen fühlte. Die Lieder gehören zu den am besten bewahrten Geheimnissen seines Repertoires und stellen einen unermesslichen Schatz dar. Fast ein Viertel von Sibelius’ Liedern sind Vertonungen von Texten Johan Ludvig Runebergs (1804–1877), des großen finnischen Dichters, der auf Schwedisch schrieb und zweifellos Sibelius’ Lieblingsdichter war. Die Liedsätze des opus 13 entstanden fast alle nach Texten von Runeberg und stammen vom Beginn der 1890er Jahre: in der Tat wurden sie in der Presse bereits 1892 angekündigt, im selben Jahr, in dem der Komponist mit der Kullervo-Sinfonie seinen Durchbruch errungen hatte. Zu ihnen gehören Våren flyktar hastigt („Der Frühling fliegt dahin“) und Under strandens granar („Unter den Fichten“). Der letztere Satz entstand auf seinen Flitterwochen im Sommer 1892 in Monola am Pielsjärvi-See. Runebergs Gedicht hat etwas vom Geist einer Volksballade: es erzählt, wie ein Wassergeist einen gutaussehenden jungen Mann durch Erscheinung in verschiedenen Verkleidungen verführt. Sibelius’ Satz verwendet ein paar freie Rezitativ-Partien, und die Struktur der Klaviermusik wurde offensichtlich gemäß orchestralen Begriffen konzipiert. Sein Begleiter auf dieser Platte, Våren flyktar hastigt, ist eine der perfektesten Miniaturen, deren bewegliche, geschmeidige Phrasierungen die Vergänglichkeit der Jahreszeiten andeuten. Das Opus 17 wurde zu verschiedenen Zeitpunkten zwischen 1892 und 1902 verfasst und enthält Illalle („An den Abend“, 1898), eine seiner seltenen Vertonungen eines finnischen Texts, die zu den lyrischsten und ergreifendsten seiner Lieder gehört. Dieses Lied wird manchmal unter dem Titel Om kvällen auch auf Schwedisch gesungen. Es zeichnet sich durch sehr reine Linienführung, vollkommene Schlichtheit und perfekte Harmonie von Zweck und Mitteln aus. Die Begleitung beschränkt sich auf die schlichteste Anreicherung von Harmonien, und die Vertonung der Sprache wird durch ihre eigene verbale Klangmusik angeregt. Man braucht keine speziellen Sprachkenntnisse, um zu erkennen, dass Sibelius bei der Vertonung des Finnischen seinen Ansatz zur Behandlung der Stimme ändert. Die Vokallinie scheint einen Großteil der Klangmusik der Sprache selbst zu tragen: wenn man Illalle auf Schwedisch vorgetragen hört, ist dies ein ganz anderes Erlebnis. Finnisch ist eine flexionsreiche Sprache, die auch reich an Vokalklängen ist, und diese Lieder zeigen Sibelius’ wachsendes Selbstvertrauen bei ihrer Behandlung. Noch bis zum Beginn der 1890er Jahre unterliefen Sibelius kleine Irrtümer, wenn er Finnisch schrieb. Die Lieder Opus 36 gehören zu Sibelius’ beliebtesten. Svarta rosor („Schwarze Rosen“) ist wahrscheinlich das bekannteste aller dieser Lieder, und seine Faszination besteht in der Verdüsterung der Stimmung bei den Worten „Ty sorgen har nattsvarta rosor“ („denn das Leid hat Rosen mit schwarzen Blüten“). Diese Phrase schwebt auf der zweiten Position des Cis-Moll-Akkords, bevor sie sich auf der C-Dur-Tonika auflöst. Aber obwohl dies ein herrliches Lied ist, das seine Popularität verdient, verblasst es im Vergleich zum zweiten der Gruppe, Men min fågel märks dock icke („Aber mein Vogel braucht lang zum Heimflug“), einer weiteren Runeberg-Vertonung. Diese besitzt eine Schlichtheit des Ausdrucks, eine Unmittelbarkeit der Atmosphäre und einen rein melodischen Schwung, die ihm zu Recht einen hohen Rang im Pantheon der Werke von Sibelius sichern. Runebergs Naturlyrik scheint aus der tiefsten Inspirationsquelle in Sibelius zu schöpfen, denn Men min fågel märks dock icke ist nicht allein eines seiner perfektesten Lieder, sondern kann mit Recht als eines der schönsten im gesamten romans-Repertoire gelten. In seiner definitiven, fünfbändigen Studie des Komponisten erinnert Erik Tawaststjerna uns daran, dass die emporstrebende Figur, die das Lied einleitet, „fast an die Eröffnungstakte des Schwans von Tuonela erinnert, und dass das Lied selbst natürlich mit einem Hinweis auf einen Schwan beginnt!“. Karl Ekman gibt 1899 als Entstehungsjahr für diese Lieder an, aber dies ist nur für die ersten drei stichhaltig. Der helsinkische Verlag Fazer und Westerlund kaufte Svarta rosor für die bedeutende Summe von 370 Finnmark, und ganz offensichtlich waren Men min fågel und Bollspelet vid Trianon in diesen Kauf eingeschlossen. Bollspelet vid Trianon („Tennis in Trianon“) ist eine Vertonung eines Textes von Fröding, einem der größten schwedischen romantischen Dichter des neunzehnten Jahrhunderts, und dieses Gedicht bringt in Sibelius eine besonders empfindliche Saite zum Erklingen, da der Klavierpart eine Gewandtheit besitzt, die nicht immer in seinen Kompositionen für Tasteninstrumente anzutreffen ist. Bollspelet vid Trianon weist beträchtliche Subtilität bei der Behandlung von Kontrast und dem Wechsel zwischen Rezitativ und einem Pasticcio im pastoralen Stil auf, und in seinem Hintergrund ist die Vorahnung der herannahenden Revolution spürbar. Säv, säv, susa („Seufzt, Seggen, seufzt“) ist ebenfalls ein Gedicht von Fröding, das in sich selbst so reich an verbaler Klangmusik ist, dass es eine enorme Herausforderung an den Komponisten gestellt haben muss. Dieses Gedicht, das im englischsprachigen Raum auch unter dem Titel „Ingalill“—dem Namen seiner Heldin—bekannt ist, verdient seine Popularität in jeder Hinsicht. Sibelius steigert den Klanginhalt der Worte durch eine sanfte, seufzende Begleitung harfenähnlichen Charakters—und tatsächlich spielt die Harfe eine wichtige Rolle in der von Alexander Hellman erstellten Transkription für Orchester, die Sibelius später genehmigte, und die Rückkehr zu diesem Eröffnungsteil wirkt zugleich magisch und ergreifend. Zur Komposition der verbleibenden beiden Lieder des opus 36, Marssnön („Der Märzschnee“) und Demanten på Marssnön („Der Diamant auf dem Märzschnee“) wandte sich Sibelius dem finnischen Dichter Josef Julius Wecksell (1838–1907) zu, der in schwedischer Sprache schrieb und dessen Werk in mancher Hinsicht Heine verpflichtet ist. Angeblich besitzt er, obwohl er schon in relativ jungen Jahren dem Wahnsinn verfiel, etwas von der Intensität eines Shelley. Beide Gedichte beschäftigen sich mit dem Thema des Todes, der seine Schatten über den Moment der Erfüllung wirft. Die Liederreihe Opus 37 enthält zwei Runeberg-Vertonungen: Den första kyssen („Der erste Kuss“) und Flickan kom ifrån sin älsklings möte („Das Stelldichein“), das manchmal auch den Titel „Das Mädchen kehrt von einem Besuch bei ihrem Liebhaber heim“ trägt. Wie gewöhnlich bei einer Vertonung von Runeberg ist Sibelius’ musikalische Sprache direkt und konzentriert sich auf Melodielinienführung, wobei eine allgemein funktionelle Klavierbegleitung für harmonische Unterstützung sorgt. Den första kyssen wurde für Ida Ekman, die Mutter seines ersten Biografen Karl Ekman, eines beredten Interpreten seiner Lieder, verfasst. (Sie war es, die Brahms 1895 eines seiner Lieder unter Klavierbegleitung von Hanslick vorsang.) Den första kyssen entstand übrigens im Jahr 1900, und nicht etwa 1898, wie Ekman, Solanterä und die früheren Ausgaben meiner eigenen Monografie Master Musicians angeben. Lasse liten („Klein-Lasse“) stammt aus dem Jahr 1902, und Soluppgång („Sonnenaufgang“) aus demselben Jahr: wiederum widerlegten neuere Beweise die zuvor akzeptierte Datierung. Sibelius sprach im Mai 1902 von seiner Arbeit an Tor Hedbergs Soluppgång, das er als „ein leichtes, aber stark atmosphärisches Gedicht“ beschrieb. In der Tat ist es dies, und Sibelius’ Satz beschwört diese Stimmung mit großer Gewandtheit herauf. Lasse liten wurde ob seiner tiefen, fast ausschließlich im Bassschlüssel verfassten Begleitung kritisiert. Und doch besitzt sein subtiler Rhythmus, der so perfekt auf den Sprachrhythmus der Verse von Topelius abgestimmt ist, merkwürdigerweise eine überzeugende Note, und die düsteren heraufbeschworenen Farben vermitteln die Idee einer großen, weiten Welt mit allen den ihr eigenen Gefahren, die außerhalb der schützenden Umarmung der Mutter lauert. Deutsch war natürlich Sibelius’ erste Fremdsprache (er sprach wenig Französisch oder Englisch), und es war selbstverständlich, dass er zu einer Zeit, in der seine Musik in den ersten Jahren des Jahrhunderts allmählich in Deutschland Anklang fand, sich in seinem Opus 50 einer bedeutenden Sprache zuwandte. Zwei der Werke dieses Zyklus, Im Feld ein Mädchen singt und Die stille Stadt, gehören zu seinen vollendetsten Liedern. Lenzgesang, die Vertonung eines Textes von Fitger, leidet unter einer Klavierbegleitung in zu tiefem Register, die nicht richtig mit der Stimme verschmilzt, aber der Vokalpart selbst besitzt eine überschäumende Fröhlichkeit und ist sehr reizvoll, was auch auf seinen unmittelbaren Nachfolger Sehnsucht zutrifft. Dieses Lied besitzt die Schlichtheit und den Schliff der besten schwedischen Vertonungen, und die Klavierbegleitung ist ergreifend in ihrer Unmittelbarkeit und Knappheit. Der Klavierpart mit seinen sanft angedeuteten synkopierten Akkorden verleiht dem Lied ein besonderes Pathos. Aus banger Brust, die erste Vertonung eines Werks von Dehmel, einem auch von Mahler bevorzugten Dichter, ist voller Leidenschaft, und Sibelius schuf später eine Partitur dafür; das wahre Meisterwerk ist jedoch sein Begleiter, Die stille Stadt. Dieses Lied besitzt die Konzentration und Atmosphäre eine Klanggedichts: in der Tat zeichnen seine Heiterkeit, Schönheit der Linienführung und ruhevolle Stimmung es vor den anderen aus. Es ist ein bedauerlich vernachlässigtes Lied, das großen Adel und große Feinheit des Gefühls besitzt. Seine subtilen Verlagerungen des harmonischen Schwerpunkts hallen noch in der Erinnerung nach. Das letzte Lied dieser Reihe, Rosenlied, besitzt zwar nicht den gleichen hohen Rang, jedoch großen Reiz und einen fast wienerischen, flotten Rhythmus. Die Lieder des Opus 50 entstanden im Jahr 1906, in dem Sibelius auch die sinfonische Fantasie Pohjola’s Tochter und die Zwischenmusik zu Hjalmar Procopés Schauspiel Belsazars Gastmahl komponierte. Aus diesem letzteren Werk stammt das Lied Den judiska flickans sång („Der Gesang des jüdischen Mädchens“). Dies ist ein ergreifendes, besinnliches Stück, das als „Solitüde“ in der später im selben Jahr von Sibelius komponierten Konzertsuite bekannter ist. Ernst Josephson (1851–1906) war nicht lediglich Dichter, sondern daneben auch Maler. Er verbrachte den Hauptteil seines Lebens in Frankreich, war ein Schüler Manets, und seine Gemälde überschatteten in gewissem Maße seine dichterischen Leistungen. Die acht Josephson-Sätze des Opus 57 entstanden 1909, im selben Jahr wie das Streichquartett Voces intimae. Das lieblichste dieser Reihe ist das Jag är ett träd („Ich bin ein Baum“), das eine viel kühnere Melodieführung als seine Begleiter und eine viel kraftvollere und tief eigentümliche Atmosphäre besitzt. Näcken („Der Wassergeist“ oder „Elfenkönig“) ist ebenfalls ein interessantes Lied, das eindrucksvoller Momente düsterer Poesie aufweist. Während des Kriegs zwischen 1914 und 1918 hatte Sibelius keinen Zugriff auf sein Einkommen und komponierte eine Vielzahl von Miniaturen einschließlich der vier Liederzyklen Opus 72, 86, 88 und 90, den letzteren Zyklus nach Texten von Runeberg. Das erste Lied des Opus 90 ist das berühmteste dieser Gruppe: Norden („Der Norden“) erschließt, wie die gesamte Naturpoesie Runebergs, eine besondere Inspirationsquelle im Komponisten. Eine stetige, sanft synkopierte Figur wird durch das gesamte Lied aufrechterhalten und dient dazu, die Aufmerksamkeit des Hörers auf die sich wandelnden Harmonien und die beredte Vokallinie zu lenken.